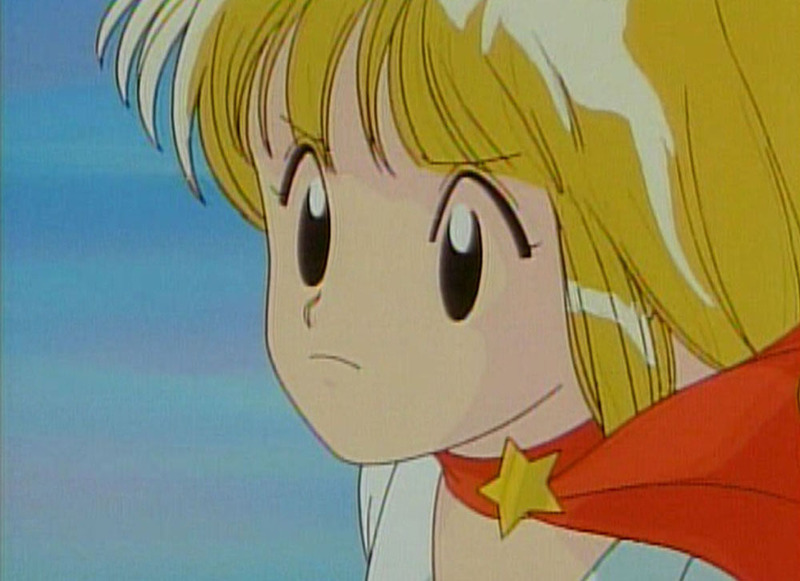 Portions of this article originally appeared at the now-defunct Anime Jump. A power-suit crime wave paralyzes Tokyo, and only one person can stop their reign of terror - a 13 year old girl with superhuman strength, an ultra-high-tech fighting suit, and an idol singing contest to win! That’s how we assemble Assemble Insert, one of those late 80s OVAs that spent a few years on the knowledgeable anime fan's dream release list alongside titles like the similarly themed Prefectural Earth Defense Force. Thankfully, both got North American releases, so nerds like us can quit complaining. Insert is a 2-part original anime video story of Tokyo in the near future, where more and more crimes are being committed by miscreants using powered armored mechanical suits, confronted by a special division of the Tokyo Metropolitan Police specially set up to combat this menace. If this is all sounding a lot like Patlabor, there's a good reason. Both Assemble Insert and Patlabor share the same author/character designer, Masami Yuuki. So if you're a fan of eminently workable mecha designs and dazed-looking municipal slackers, you're in luck. Yuuki’s original 1985 Assemble Insert manga ran in AniParo Comics, which was published by Minori Shobo, who also published the seminal Japanese animation fan magazine OUT from 1977-1995, without which we might not even be wasting our time on this whole Japanese animation fandom thing, so there’s that. 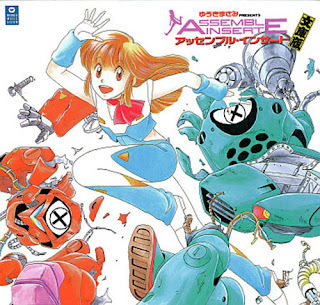 Patlabor and Assemble Insert part ways, however, in their approach to combating mechanized crime; while Patlabor fights fire with fire, Assemble Insert takes a different approach, one that involves talent contests and idol singers. The Counter-Demon Seed Special Agent Bureau, the crew of fairly indistinguishable, fast-track-to-early-retirement police functionaries charged with stopping this power-suit crime wave, decides their best course of action is to sponsor talent-contest style auditions in the hopes of finding someone who can battle Demon Seed. Sure, Chief Hattori was drunk when he came up with the idea, but maybe the ancients were on to something when they said “in vino veritas.” Anyway, it’s nice to see police thinking about putting their best face forward to the public for a change, and the Counter-Demon Seed Special Agent Bureau wants to make sure their Demon Seed-fighting is done with maximum public appeal. Enter Marin, a shy sub-deb who happens to be strong enough to bend steel in her bare hands. She's cute, she's innocent, she has all the doe-eyed naivete necessary for every Japanese idol, and she's just the size to wear Shimakobe's suit. But can Marin-chan overcome her stage fright long enough to pound Demon Seed's robot suits into scrap? Similar to but less boisterous than the aforementioned Prefectural Earth Defense Force, Assemble Insert spoofs the pop-culture tropes of Japanese SF media – robot suits, super-gals, evil geniuses – but adds its own touches, like energy-drink product placement in the anime that smash-cuts to a live-action commercial break for the same energy drink, starring Assemble Insert voice talent. The opening scene mimics sentai legend Changeman (and stars characters from Yuuki’s Ultimate Superman R) and Assemble Insert’s staff makes numerous appearances as characters, along with a cameo by Patlabor’s Noa Izumi. Demon Seed’s leader Dr. Kyozaburo Demon is from the same mold as any one of the hundreds of evil scientists battling Gigantor or Prince Planet, while his henchmen wear giant eyeball masks in tribute to Kamen Rider Stronger’s Titan. And of course, comedically accidental destruction wrought by our well-meaning heroes is in full effect. The Counter-Demon Seed Squad schedules Maron’s debut for maximum press attention. What appears to be the big Seibu department store at Ikebukuro Station is hosting a collection of rare artifacts, priceless artworks from the Mu Empire. This allows Assemble Insert to reference both old Toho SF movies and 70s super robot cartoons, and gives Demon Seed a target for pillage. When Demon Seed arrives right on time, Maron’s first public appearance is filled with both awkward stage-fright jitters and shocking damage to Ikebukuro, one of Tokyo’s busier neighborhoods and currently the site of several otaku-destination shopping experiences. Flush with victory, the second episode sees our heroes become victims of their own success. Without Demon Seed around it’s tough to justify the expense of an Anti-Demon Seed Task Force, and Chief Hattori (based on Masami Yuuki’s editor) is now focused on the earning potentional of Maron’s idol career. Soon Maron is making the rounds of product endorsements and chat shows instead of battling for justice. It's up to Professor Shimakobe to secretly supply the enemy with the necessary trouble-making equipment and give his task force a reason for existence, and shortly Demon Seed announces an attack on the National Mint! 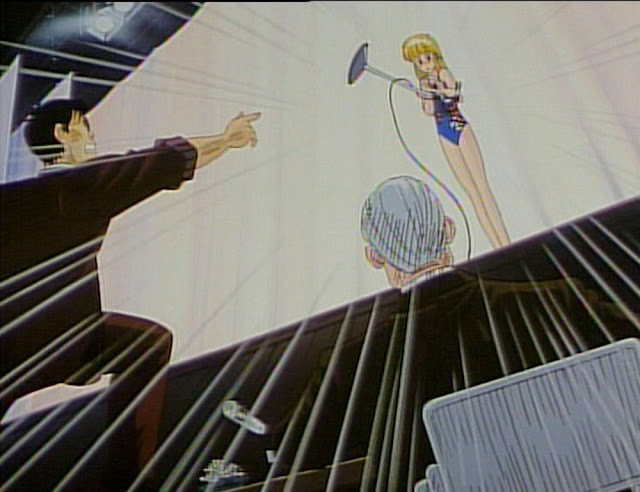 Of course, this climactic battle coincides with Maron’s appearance at the Music Awards. Will the Counter Demon Seed Task Force put on their big-cop pants and fight Demon Seed single-handedly? Will Maron choose idoling over enforcing? Just like its characters, the second episode suffers from a bit of the sophomore slump. Once our Assemble Insert world is assembled and Maron does her thing, there’s little left for anybody to do – heck, the episode fades out before Maron punches a single Demon Seed power suit, as if it’s bored with itself. Characters as thinly drawn as Insert’s aren’t going to drive much of a story; the only emotion Maron is allowed to verbalize about her singing super-cop status is “kind of embarrassed”, her handlers are phone-gabbing, note-taking nonentities, and Doctor Demon himself, though claiming to be “fair and square for evil”, limits his do-baddery to broad Batman ’66-type villainy. Still, as an airy OVA confection, Assemble Insert does its job well; which is to deliver manufactured-idol comedy robot-crime busting in 25 minutes or less. Released in Japan in late 1989/early 1990, both OVAs were released in North America by The Right Stuf in 2001, with a reissue in 2004. Directed by Del Power X veteran Ami Tomobuki, the staff included mecha design by Gundam/Patlabor designer (and future Yamato 2199 director) Yutaka Izubuchi and some animation by Studio DEEN, who have been involved in pretty much everything animated in Japan for the past three decades, go ahead, look it up. Dedicated Assemble-ologists can find a small but significant collection of merchandise that includes VHS and Laserdisc releases as well as model kits of Demon Seed’s mecha and figures and garage kits of Maron. The original manga has been released in tankubon form on a few occasions, and if Ikebukuro is still standing after Maron destroys Demon Seed, you can probably pick it up in their Book-Off location up the street from the Sunshine 60 building. The Right Stuf’s DVD was translated by C.B. Cebulski and the English subtitles feature formatting assistance from anime localization superstar Neil Nadelman. The English dubbing features a star turn by Jessica Calvello as Maron, and there are some interesting Muppet-voice impressions used for the Demon Seed henchmen, while one of the police is a dead ringer for SNL’s 70s stoner-comedy puppet Mr. Bill. There's not a whole bunch of extra stuff on the DVD, but hey - this is a 2-part OVA from decades ago, so relax. Assemble Insert never goes as far as contemporaneous girl-power gagfests like Project A-Ko, Dirty Pair or Urusei Yatsura; destruction is never as total and gags aren't as extreme. But that’s okay; not everything needs to be cranked to 11. The reserved yet ridiculous nature of Yuuki's characters helps Assemble strike a middle ground between gonzo comedy and the grounded, humanistic SF of another, more popular Masami Yuuki creation, Ultimate Superman R... no, wait, I mean Patlabor. Editors’ note: fans of Yuuki and Patlabor may want to check out Colony Drop’s latest Last American Fanzine; this one’s devoted to Patlabor and features art and articles by a whole host of contributors, including yours truly! Get it today!